So, one day I give you green macaroni and cheese . . . and the next, doughnuts. I like to keep you on your toes. FACT: Did you know you can roast Brussels sprouts and bake doughnuts at the same time? 350 degrees F, baby. It's the sweet spot in the range of oven temperatures, I suppose. And I didn't realize until last night, but it's that sort of brilliant multi-tasking I strive to discover in all areas of my life. 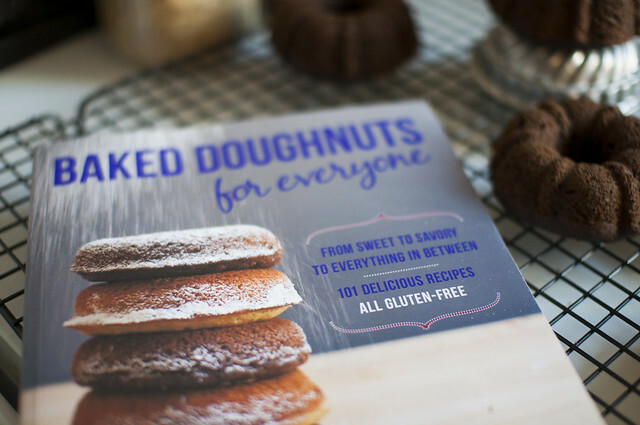 I had long been awaiting the release of Edible Perspective Ashley's amazing cookbook Baked Doughnuts for Everyone: From Sweet to Savory to Everything in Between, 101 Delicious Recipes, All Gluten-Free. And when Ashley generously offered a chance to review a copy, I signed on gladly. Ashley was my first blog friend ever. All her hard work has definitely paid off -- and I am so, so proud of her. So, the night I received my book in the mail, I was elbows deep in Ada's surgery situation. Yet somehow despite everything going on, all the delicious photos (Ashley's photos are THE BEST!) sucked me into making a batch right then and there. No joke. It was just the stress release I needed at that moment. 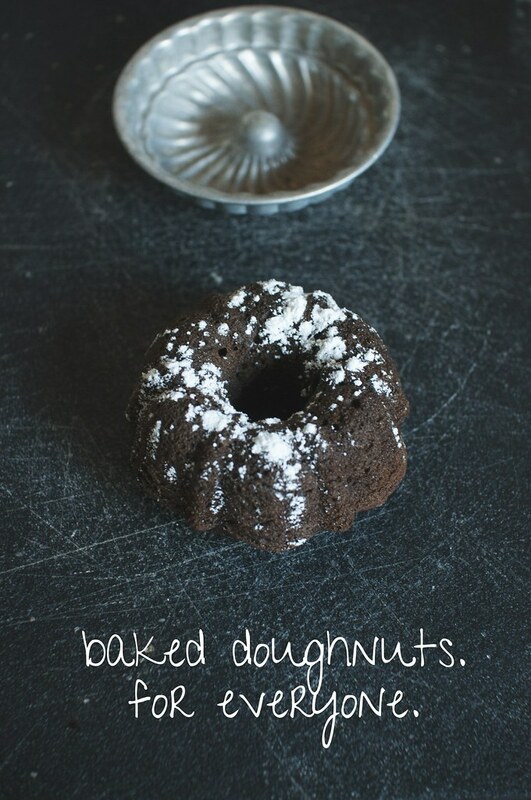 I chose to bake the Vegan Gooey Chocolate Doughnuts with a tasty chocolate glaze. We've since discovered in our house that this recipe is a new favorite. 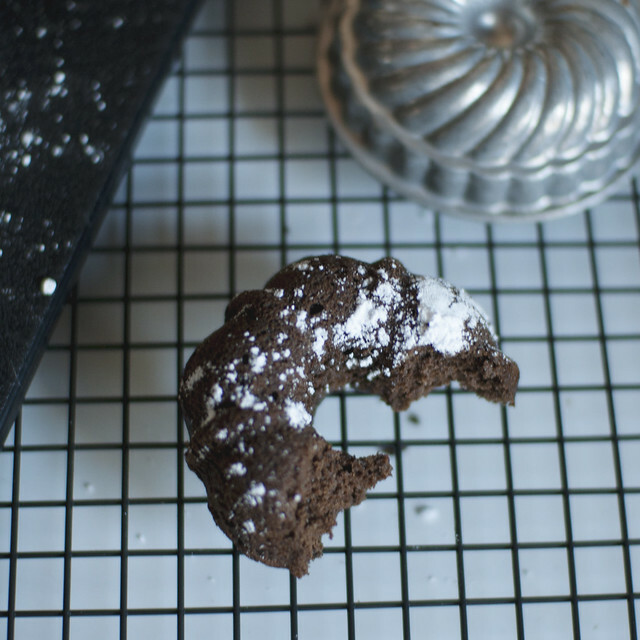 It's healthy, light, sweet, and just as good with a simple dusting of powdered sugar, which is how I made them for this review. I even give these doughnuts to Ada for breakfast. Combine the oat flour, sweet rice flour, cocoa powder, cane sugar, coconut flour, flax meal, baking powder, baking soda, and salt in a large bowl, mixing well. In another bowl, whisk together the milk, brown rice syrup, pumpkin puree, oil, and vanilla extract until well combined. Pour the wet mixture into the dry ingredients and stir with a large wooden spoon until just combined, being careful not to overmix (stop when you no longer see dry flour). Gently fold in the chocolate chips. The mixture will be thick. Spoon the batter into the doughnuts molds, filling just below the top of each mold, 1/8 - 1/4 inch from the top. Bake for 20 to 26 minutes until lightly golden brown around the edges. The cake is supposed to have a gooey center. Let cool in the pan for 5 minutes. Slide a thin spatula around the edges of the doughnuts and help loosen then out. Then place on a cooling rack and allow to cool for 5 to 10 minutes. 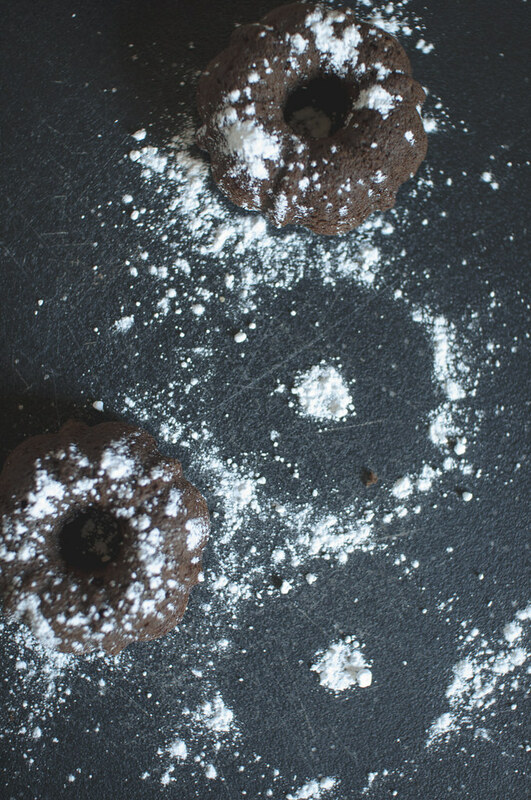 This recipe makes 8 to 10 doughnuts in a standard doughnut pan. 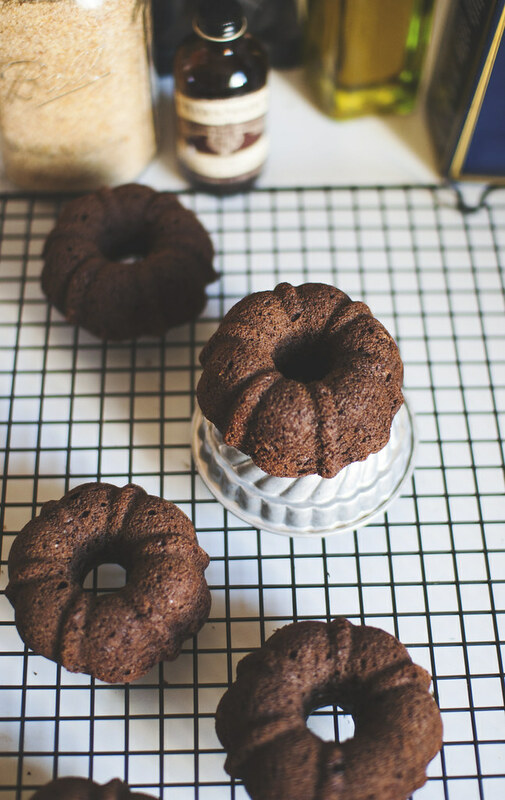 You may have noticed I used a mini bundt pan to make my batch. Whatever works! I'm also happy to write as a non-gluten free person, I am able to adapt Ashley's recipes to whatever ingredients I have on hand. I've made some of the sweet + savory doughnuts exactly as written in the book and others with like ingredients (like white-whole wheat flour in place of substitutes or coconut sugar in place of cane, etc.) in the same ratio -- all with excellent results. Thanks to Ashley's publisher, if you'd like a chance to win a copy of this book -- please leave a comment below! Make sure you leave some way of contacting you. Winner will be chosen via random number generator + announced next Friday morning (11/15).